I bought my first Wiccy Magic Muscles Massage Bar back in June when I had my first LUSH experience. I am obsessed with any type of cinnamon fragrance – I love my cinnamon scented Yankee Candles (Sparkling Cinnamon and Home Sweet Home) and my Warm Apple Pie (doused with cinnamon) Village Candle. If you would like to read a bit more on what LUSH stands for (as a company), then have a look at these blog posts here and here. After our holiday in Cape Town about a week ago, I now own 2 extra Wiccy Magic Muscles bars (yes, I love it so much I have a backup for my backup). I tend to do this quite often, if I really love a product I will make sure I have a few spares, in case it is discontinued or a zombie apocalypse happens (both would probably have the same effect on my psyche). I also bought a little silver tin for this bar (available from LUSH) because it keeps the massage bar travel-ready & I just think it looks snazzy in a silver tin. I wanted to share my love for this little bar with a fellow blogger, so I bought one for Chicara from Lipgloss Kisses for her birthday. Ok, so now you already know I love this little bar but I’m still going to do a full review for you – I hope you enjoy! What LUSH says: It’s a kind of magic – on tired achy muscles. A warming workout for tired knotted muscles and aching shoulders. Cocoa butter, shea butter, extra virgin coconut oil and organic jojoba oil are the base of this bar and give a lovely glide on the skin. But their main role is to carry and hold onto the skin the lovely blend of warming essential oils including cinnamon oil to warm the skin and peppermint to get the blood flowing. 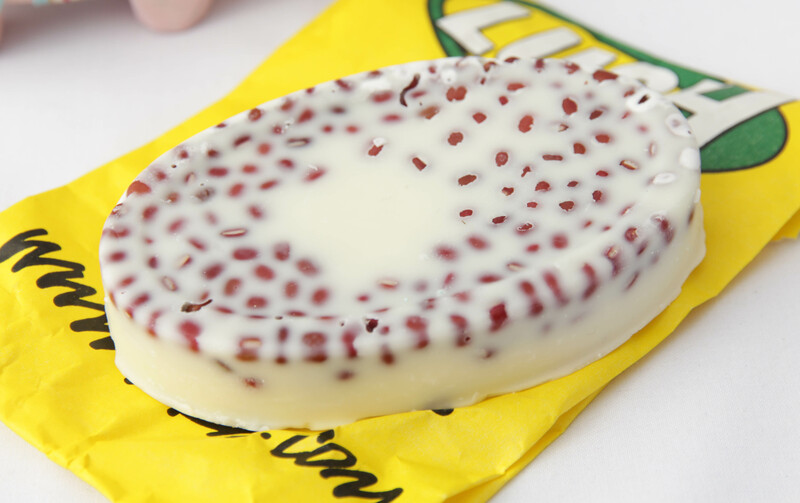 My review: Ok, so we already know the spicy scent of this massage bar had me completely sold. To me, it smells like I’m covering my body in fireballs (the jawbreaker candies). Not only is this pretty awesome but the added bonus is that it moisturises your body because it contains 2 butters (shea & cocoa)and coconut oil (now, you know I love me some coconut oil!). I rub it between my hands after I get out of the shower, this makes the massage bar melt (not completely melt into a mess, don’t worry). I then massage my whole body with this lovely little knobbly bar. You can see in the photo, the one side is knobbly (these are actually aduki beans) and the other side is quite smooth. To be honest, I don’t really use this as a massage bar per se (although it is said to relieve muscle tension), I use it as a bi-weekly body moisturiser. I apply it about 30 minutes before I get in bed to make sure the oils are absorbed into the skin and by morning, the scent is still there! I wish all computers had a ‘Scratch & Sniff’ pad, because I would enter this magical scent >HERE<. You can take my word for it, the mixture of cinnamon, peppermint and cloves is incredible. The peppermint oil has a cooling effect on the skin and the cinnamon oil has a tingling and warming effect. The pro: The Wiccy Magic Muscles massage bar is a great body moisturiser plus the cinnamon and peppermint oils help to soothe the body and relax the mind. I always have a good night’s sleep whenever I use this little bar. Basically, Mr. Wiccy and I are in a committed relationship (and will continue with this long-term love affair, until that zombie apocalypse arrives). The con: When the bar gets thinner, the aduki beans fall out and it breaks in half. This, to me, isn’t a huge issue because the beans aren’t tiny and a smaller piece of the bar fits perfectly in your hand. The tip: I rub the knobbly side over my thighs and pretend the beans helps for my cellulite (increased blood flow is good for cellulite, right?). Also, this is an oil-based bar so try not to leave it lying around on your bed sheets (it will make an oil stain, especially on hot days). Before I had my little tin, I used to keep it in the LUSH recycled paper packet. ALSO, this would be perfect to use as a type of Vicks VapoRub when you (or a family member) are sick because it clears up the sinuses. The price: R 90,00 (available at LUSH V&A Waterfront or LUSH Cavendish Square). If you guys would like me to review the effectiveness of this bar as a massage bar, let me know. I’ll get Neal to use it after one or two of his mountain bike races – but to be quite honest, I’m a bit hesitant to share (haha)! Your raves over LUSH make me want to find the nearest store and buy them out! So I can be ready for a zombie apocalypse too! Hehe! I’m pretty sure they’ll be opening up a store in Jhb soon (the sales girl said they are working on it) – if a store opens up here I’ll be more than happy to send you some things! 🙂 Also, she said they’re desperately trying to get the online shop up and running before the holiday season starts! I had this bar in my hands the last time I was at Lush and I put it down and now you are really making me regret that! My absolute favourite scent. I’m obsessed with cinnamon. I LOVE my little wiccy bar. Thank you so much Luzanne! Such a shame Eric gets a headache from it… 🙁 Maybe only use it then early in the morning to give the scent time to fade a bit, should be ok by the time he’s home in the afternoon. Ooooooh that Peace one sounds amazing! That’s next on my list! I am beyond obsessed with coconut / creamy scents! Wow, now I’m adding another one to my list as well – the beer shampoo sounds divine! Goodness knows, I love shiny hair! Now I really wish JHB had a Lush … This sounds devine ! Another Lush thing I need to get when I go to Cpt. I am making a list of all these things so I wont forget! I love this super much too!